Rio de Janeiro is one of the 27 states of Brazil. It has the second largest economy of Brazil, with the largest being that of the state of São Paulo. The state of Rio de Janeiro is located within the Brazilian geopolitical region classified as the Southeast (assigned by IBGE). Rio de Janeiro shares borders with all the other states in the same Southeast macroregion: Minas Gerais (N and NW), Espírito Santo (NE) and São Paulo (SW). It is bounded on the east and south by the Atlantic Ocean. Rio de Janeiro has an area of 43,653 km². Its capital is the city of Rio de Janeiro, which was the capital of the Portuguese Colony of Brazil from 1763 to 1815, of the United Kingdom of Portugal, Brazil and the Algarves from 1815 to 1822, and of independent Brazil from 1822 to 1960. Rio de Janeiro is the smallest state in the Southeast macroregion and one of the smallest in Brazil. It is, however, the third most populous Brazilian state, making it the most densely populated state in Brazil and the third longest coastline in the country (after those of the states of Bahia and Maranhão). In the Brazilian flag, the state is represented by the Beta star in the Southern Cross (β = Mimosa). The coastline extends 635 kilometres and is formed by the bays of Guanabara, Sepetiba, and Ilha Grande. There are prominent slopes near the ocean, featuring also diverse environments, such as restinga vegetation, bays, lagoons and tropical forests. Most of the state however consists of highlands, often higher than 1,000 metres, formed by several mountain chains like the Serra do Mar which separates Rio from the state of São Paulo. The highest point of the state, the Pico das Agulhas Negras (Black Needles Peak) is located in the Serra da Mantiqueira which forms the physical border with neighbouring Minas Gerais. Ilha Grande is an island off the coast of the Brazilian state of Rio de Janeiro and is a popular place to enjoy both lush Atlantic rainforests as well as tropical beaches. Apart from relaxing in a hammock at your accommodation or at a beach, the island has around 150 kilometres of hiking trails between the villages and across the rainforest. There is wide range of animals, some of which you might spot during hiking, including endangered ones like the brown howler monkey, the red-browed Amazon parrot and the maned sloth. The Niterói Contemporary Art Museum is located in the city of Niterói. The city can be reached by a bridge from Rio de Janeiro. 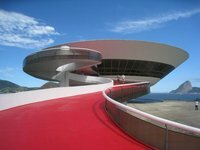 It was completed and opened in 1996 and the design of the museum is by the famous Oscar Niemeyer. The shape of the museum resembles a saucer/UFO. From the viewing gallery you can see Guanabara Bay, Rio de Janeiro and the Sugarloaf Mountain. For more information, visit the official Museum website. Carnival in Rio de Janeiro is the greatest partiy on Earth. And this partying tradition goes a long way back: the first carnivals in Rio were celebrated in 1723. The Rio de Janeiro Carnival, or "Carnaval do Rio de Janeiro" for locals, is held four days before Ash Wednesday, usually in February, but sometimes as early as late January or late as early March (like in 2011). Quite different to the European celebrations due to its mixed African, Native, Portuguese, German and other European countries elements, Carnival in Brazil has also variations by region. In the southeast (Rio de Janeiro and São Paulo), Carnival focuses on organised parades. This carnival parades are carried out by "samba schools" (or, in Portuguese again, "escolas do samba") which compete in the "sambodromo". In this kind of Carnival only affiliates can parade. However, on smaller cities, since there are no large public events but the municipalities promote celebrations in clubs or beaches. Since the 1930s the parade traditionally goes from Sunday evening until early morning Monday in the Sambadrome, which is a large structure that includes several buildings forming a large open circle and covers 700 metres of Marquês de Sapucaí Street, converted into a permanent parade ground. The "Sambódromo", as it is called in Portuguese has bleachers for spectators on both sides and it can seat ninety thousand people. Annual mean temperatures on the coast are around 23 °C, 26 °C in summer and 20 °C in winter. In the mountains annual mean temperatures are around 18 °C but can range from 20 °C at an elevation of 600 to 700 metres above sea level to 7 °C in the Itatiaia National Park. Summers in these areas tend to be warm but not hot, with averages around 22 °C. Winters are quite chilly by Brazilian standards with lows around 8 to 9 °C. Rains tend to be concentrated in the summer (December to March) with a dry season in the winter (June to September). Most of the state receives between 1,000 and 1,500 millimetres of rainfall in a year. Rio de Janeiro's Galeão Antonio Carlos Jobim International Airport (GIG) is the main international airport in Brazil with dozens of international and domestic airlines offering services. It is located about 20 kilometres from the city centre. The main destinations are Buenos Aires, Paris, Miami, New York, London, Houston, Panama City, Atlanta, Sao Paulo, Foz do Iguacu, Salvador, Manaus, Madrid, Montevideo, Santiago de Chile, Lima, Lisbon and Washington, D.C.. The Santos Dumont Airport (SDU), located in the city centre, accommodates many domestic services, including Sao Paulo, Belo Horizonte, Porto Alegre, Brasilia, Cuiaba, Campo Grande and Curitiba. Airlines using this airport include Gol, TAM, Varig, OceanAir and Team. This is version 15. Last edited at 7:04 on May 20, 16 by Utrecht. 14 articles link to this page.